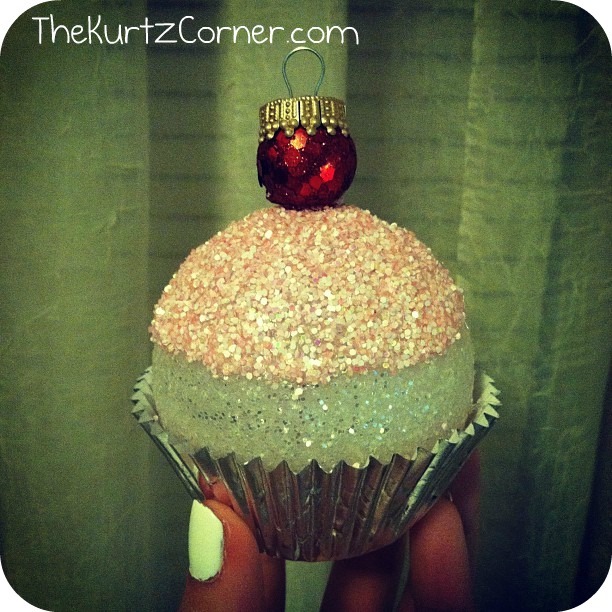 Click here to see my new DIY Cupcake Ornaments! It's is my absolute favorite time of the year! Time to dust off your jingle bells, pour yourself some peppermint hot coco and make something for Christmas! I always loved making Christmas ornaments as a kid, and well, I still do! I love putting up the tree with my family and looking back at all of the ornaments I made as a kid. So many wonderful memories. I can't wait to make more of those memories with my kids someday! Every so often I like to switch up Christmas tree themes and this year I want a sweets tree decked out in candies and cupcakes! 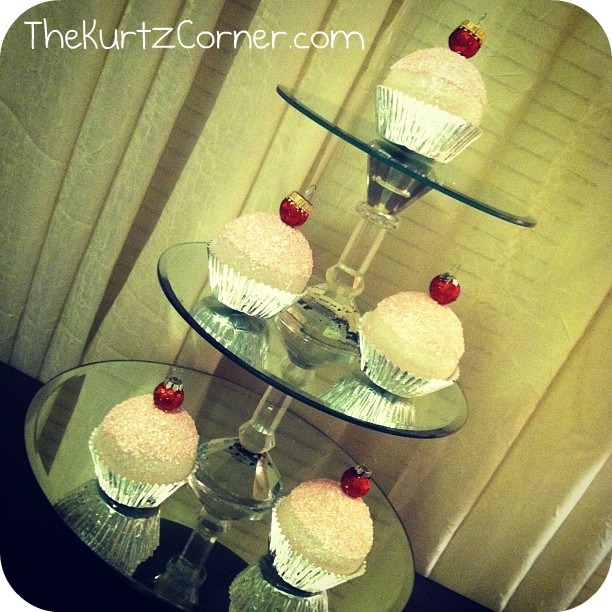 To start off the new theme I've created these cute little pink iced cupcakes. I think they turned out cute, what do you think? Want to make some of your own? Keep reading! Allow your ornament to fully dry and then hot glue on your "cherry"
These are really fun and easy to make! They would be a great craft for kids as well. Just remember, parents handle the hot glue, we don't want to burn the kiddos! Here are a few shots of my finished cupcakes, enjoy! What a cute, fun idea!! I love them! So stinkin cute girl!!! Love!! HA! Holy moly, super cute idea!! Audra these are so "sweet"! We are having a Home for the Holidays link party on our blog and I know that our readers would think the ornaments are adorable! We would love for you to join us! these are awesome! love them and they are going to look great on a tree! i am a newlywed too and a new follower! yay! I love this idea! Found you from Someday Crafts and now I am your newest follower! this is so so so sooooo adorable! oh my!!! I saw some cupcake ornaments in a store but they were pricey and I couldn't imaging spending so much on one ornament... now I think I'll have to make them using your tutorial! thanks for sharing... this really made me happy lol! Those are *so* cute! Love it! It would be a safe bet if you replaced my old button with the new one too. You know because of all that hoop-la! I OBVIOUSLY love these! Pinning them. :o) Thanks for sharing!! these are really cute and much simpler then they first appear! Thanks so much! My family is having a craft party with the clear christmas bulbs, cannot wait to share this idea! Those are just plain adorable, and oh-so-clever! I'd love for you to link this and any other current projects you have at my Shine On Fridays party! This is the cutest! I adore this little idea! At first I thought they were really cupcakes, they look that good! I am going to feature this tomorrow @ Show & Share! Thanks for linking up! Such an awesome tutorial for Christmas! This is so creative and so easy. You could have so much fun customizing the colors/details. Thanks for sharing. These are awesome! I started a sweet themed tree after seeing Cupcake Julie's on Bakerella (http://www.bakerella.com/candyland/)and it has been such a hit that I keep bringing it back. I never thought of making my own ornaments though...now I know how I'll be spending my future free time! Thanks for the great post. So stinking adorable. 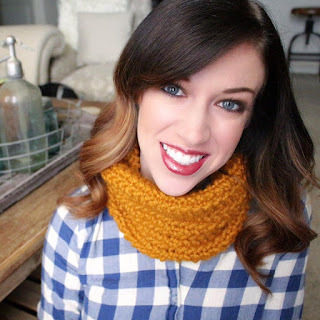 Thank you for linking up to More the Merrier Mondays. I featured these on my blog today. Cute! These are so cute! My daughter would love all the sparkle. My kids and I are makiing these for our annual ornaments for family! 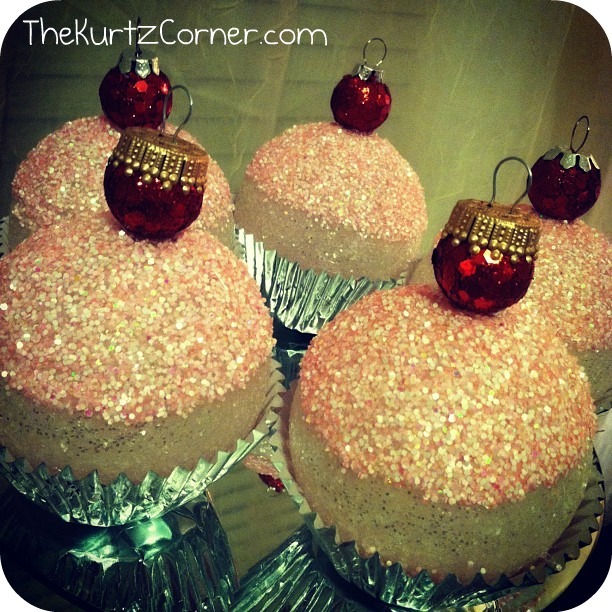 2011-Cupcakes!!!! Good for you - these are so cute... and i love how your fingernails changed colour while you were waiting for the ornaments to dry - he he! If you get a chance to help a fellow crafter, can you please click follow on my site and help me get to 20 followers! LOL!